Sophronia's first year at Mademoiselle Geraldine's Finishing Academy for Young Ladies of Quality has certainly been rousing! For one thing, finishing school is training her to be a spy (won't Mumsy be surprised?). Furthermore, Sophronia got mixed up in an intrigue over a stolen device and had a cheese pie thrown at her in a most horrid display of poor manners. Now, as she sneaks around the dirigible school, eavesdropping on the teachers' quarters and making clandestine climbs to the ship's boiler room, she learns that there may be more to a field trip to London than is apparent at first. A conspiracy is afoot--one with dire implications for both supernaturals and humans. Sophronia must rely on her training to discover who is behind the dangerous plot-and survive the London Season with a full dance card. In this bestselling sequel to New York Times bestselling Etiquette & Espionage, class is back in session with more petticoats and poison, tea trays and treason. Gail's distinctive voice, signature humor, and lush steampunk setting are sure to be the height of fashion this season. I enjoyed Etiquette and Espionage and I started Curtsies and Conspiracies soon after finishing book one. 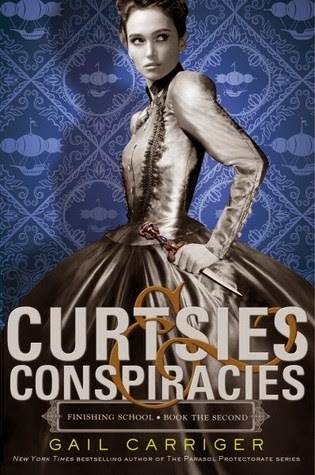 Curtsies and Conspiracies was an even better read than its predecessor! I love the world Carriger has created with this series. It's the same premise as her Parasol Protectorate series, just with the addition of the finishing school. This series is, of course, YA, and so it has a younger, fresher feel to it. Sophronia is a fun main character. She's got more personality, at least to me, than Alexia from the Parasol Protectorate series. But, she and Alexia do share qualities of pragmatism, wit, and fearlessness. In addition, they are both highly observant and quick to take action. I enjoyed seeing Sophronia flourish at school, and seeing her really own her education as an intelligencer. One of my favorite things about Etiquette and Espionage was the character crossover between this series and the Parasol Protectorate. There were several cameos from characters I already knew in this book, and I loved that. Curtsies and Conspiracies also had more action than book one. The pace was quicker and there weren't any lulls in the plot. I really enjoyed Curtsies and Conspiracies. It's light-hearted, unique, funny and just plain fun to read. I'm really loving this series, and can't wait for book three!